Woot woot! This is finally done!! After a four month hiatus I finally buckled down and just had to finish this project up. How amazing it feels to get this officially off the needles, crossed off the knitting to-do list, and out of the WIP basket!! Trust me, it feels good. Real good. This shawlette will be considered my 9th FO (finished object) for my 12 in 2011 goal. This pattern is actually super easy and should have been a quick knit but because I had wanted to use up every last inch of my yarn, I spent more time knitting and then ripping. I'm just über glad that I was smart enough to utilize lifelines! Before my hiatus I was about halfway done knitting the border when I realized that I had a ton of yarn leftover. I hemmed and hawed over ripping out the border to add another repeat and then found myself ripping before making the final decision. I guess my heart wanted another repeat! So I knit the extra repeat and was onto the border when I realized that I now wasn't sure if I had enough yarn to finish the project. Man, there's just no winning with me! I had knit 4 rows of the border before discovering that I wasn't going to have enough yarn to finish. I tried binding off after the fourth row, only to find out halfway through that I wasn't going to have enough yarn to do that either. I tinked back the bind off and a row and tried to bind off again. Bloody hell. Still didn't have enough yarn!! Baring my teeth at the shawlette, I ripped out the border (again!) and ripped out the rest of the border rows. Finally! I had enough yarn! I seriously had like, less than a meter of yarn left over once I was done!! Even though the knitting was completed, it took me forever to get around to blocking this project out. It wasn't because I was avoiding it, cause believe me when I say that I love blocking lace. There's something about it that gives me the utmost satisfaction. I think it has something to do with turning a small blob of yarn into a beautiful piece of art. Anyhoo, one night the Munchkin went to bed earlier than normal and I thought it was a perfect time to block this baby out. The Munchkin sleeping for a longer period of time meant that a blocking piece of knitting (and the pins and wires that go with it) could go for a longer period of time without being touched. Also in my favour: it was a super warm day and since I'm in the James Bay area, that meant I also had a great breeze happening for me. Yay for faster drying time! So now that this shawlette is all blocked and ready to go, I have to admit that I'm not sure if I care for it. Sad, I know. Even while knitting I wasn't sure if I was crazy about the yarn I was using. I had only knit with Noro once before, and that was to make Brett a Turn A Square hat with Kureyon. This time around I was using Retro. When I first bought this yarn my intention was to use it to weave with, but after a while the novelty of weaving with thick and thin yarns wore off. So balls of this stuff sat in the stash. 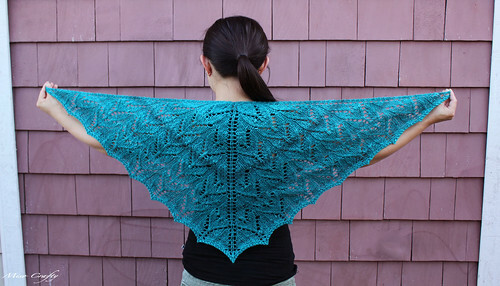 When I came across the 198yds of Heaven pattern this yarn immediately came to mind. Several times I thought my yarn was going to snap in half, it was so thin. Other times I was having such fat slubs run through my fingers that it was throwing the pattern off balance. I was really hoping that the blocking process would help smooth it out a bit. I was also hoping that a good soak in wool wash would help soften the yarn up. It was so crunchy to knit with! Half of the yarn's fiber content was wool, and it was quite obvious that it wasn't of the merino variety. I've never knit with angora before and wasn't sure if I cared for the random fibers that would fly off the yarn. I knew that silk is an inelastic fiber so I was making sure I was knitting on the loose side, but the thick and thinness was really throwing my gauge off. Then towards the end (as in, right before I was going to start the border) I held the shawlette up to take a good look at it and discovered that there was this weird black streak going perfectly across the entire shawlette. Yeah, not a fan of that either. The blocking did soften up the yarn a bit (enough so that it's now wearable) and it did even out my stitches, but there's still something about this project that just doesn't sit well with me. 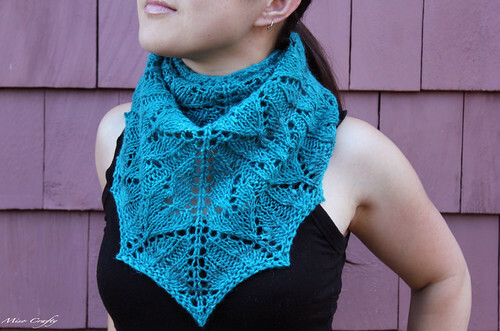 I guess I'll just have to wait until fall when I can wear this to find out for sure how I really feel about this shawlette. Don't get me wrong, this feeling has nothing to do with the pattern. At all. The pattern is awesome and I love it when designers can add both charts and written directions in their patterns. I love the colour, it has good drape. Hmm...maybe it's the yarn itself? I'll let you know when fall rolls around. The colorway looks really beautiful, particularly in the 3rd photo, almost like ripples in water. I know that feeling, though, and it's hard to let go when you're just not completely satisfied. Lovely job, and I hope that it recaptures your heart once the weather turns cooler! OMG! Gorgeous!!! Love the color! i LOVE it! it's beautiful!!!!!!!! Thanks, this colour was really hard for me to capture on camera cause it's so intense. I really hope I like it when I have to pull it out when the cold weather arrives. Thanks! It's definitely a colour that I would love to knit more of! I'm sure you can knit this...it's actually fairly easy. 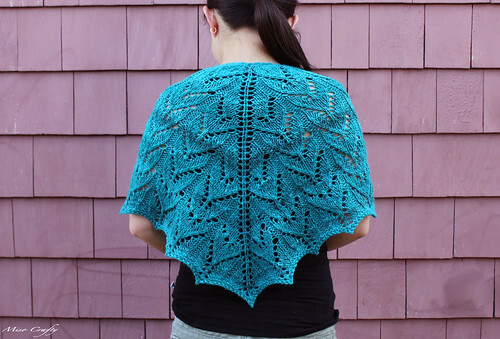 You just have to remember that lace/shawls consist of mostly yarn overs and k2tog/ssk. It might look intimidating, but once you get over that it gets pretty easy! Unfortunately I won't be making this shawlette for sale, since it's not my pattern and I do have the permission from the designer. But thanks for such lovely compliments!